Let’s not forget that most ballplayers, whether it be Derek Jeter or Lebron James or Brett Farve, are getting paid for something they love to do. They get paid to play a game. Phil Linz once said “Baseball is a fun game. It beats working for a living.” It is so true. I work a lot with young boys and it seems like half of them dream of being some kind of professional sports athlete in the future (even a few girls have this dream). They want to be ballplayers not always because of the money, but because they love playing the game. Yes, it certainly seems like athletes have it good. However, most ballplayers have a short window to play the game they love. If they are good they might have twenty years in the sport. If not, they might only get a year or two. Michael Jordan was one of the best basketball players ever. When he joined the Washington Wizards after his second retirement, it was often painful to watch him play. Not because he couldn’t play the game, but because he was so much less than what he had been. He looked slower. He no longer dunked the ball with authority or gravity defying aerobatics. On defense, younger players blew by him and he could no longer carry his team to victory seemingly at will. Each new day robbed him of his ability to play the game. I have loved watching Derek Jeter play the game of baseball. But each year I wonder if this is the year that his batting average is going to sink to mediocrity. 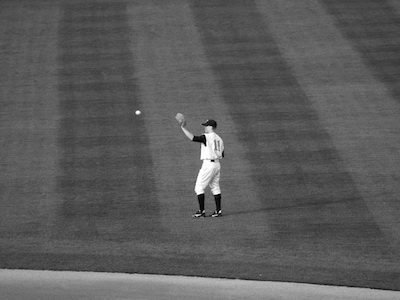 I wonder if this is the year that his range becomes so limited that they move Jeter (the Captain) away from shortstop. And every year I know that I am one day closer to the day that he will step up onto the dugout steps and wave his cap one last time, just the way Cal Ripken Jr. did a few years ago. If it is hard for me, a fan, to watch a player fade from glory, how much harder must it be for them? They have to wake up in the morning knowing and even worse feeling like it might be the last day they can play the sport they love. I have experienced it myself. I used to play basketball and baseball. Now I can barely throw a ball overhand, my shoulder is so worn from pitching. In basketball, I used to be able to tear up the court in Japan, but now I can barely reach the backboard and my knees start hurting after a couple jogs down the court. Don’t even ask how I feel the day after a game. I feel like an eighty year old man. So I know what it must have been like for Lou Gehrig to walk away from the game and I know what it must have been like for Joe Montana to walk into the locker room one last time. Its not like being a doctor or a lawyer or writer, where you can get better with time and age. In those professions, you determine when you call it quits. But in sports, time steals away your ability and eventually your profession.